Bob Glenn is a long-time resident of Owensboro and Daviess County. He is married with two children, is a long-time educator, a deeply committed public servant, and a tireless advocate for this community. Bob Glenn is currently completing his third term as an Owensboro City Commissioner (2012-Present) and in 2016, he was elected Mayor Pro Tem by earning the most votes among 10 challengers. 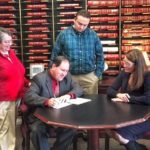 Bob is running for State Senate District 8 (Daviess, McLean, and Hancock counties) because he believes that working families, teachers, farmers, seniors, and public employees deserve a strong and caring voice in Frankfort. The policy initiatives of the Bevin administration represent a war against the poor, the middle class, union workers, seniors, retirees, and public education. Bob believes in the greatness of our people and our state. He feels the key to moving Western Kentucky and the Commonwealth forward is supporting public education, promoting workforce development at all levels, reforming our tax and pension system, and supporting economic growth that plays to our area’s strengths. Bob is a father of two and has been married to the love of his life, Holly, for 28 years. 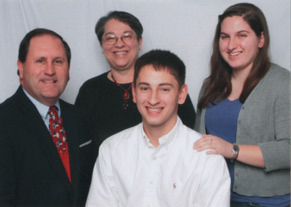 Holly, is a retired high school teacher and they have two adult children, Bobby and Caitlin. Their son Bobby is a graduate of Brescia University and is a Firefighter at the Owensboro Fire Department (OFD). Their daughter Caitlin is a graduate of the University of Louisville and a nurse in the Oncology ward at U of L Hospital. Bob enjoys reading, walking, travel, and is a huge fan of various sports including college basketball, soccer, hockey, football, and baseball. He is a certified sports official for soccer, softball, and volleyball. Bob has officiated two state championship games and has been an active member of KHSAA since 1998. As a longtime Professor of Communication at Owensboro Community and Technical College, he witnesses the positive impact of public education upon our community every day. He is an active member of his discipline and is a member and past officer in both the Southern States Communication Association and National Communication Association. He has also taught college courses as an adjunct instructor for Kentucky Wesleyan, Western Kentucky University, and the University of Southern Indiana. Owensboro won “All America City” recognition in 2013. Major economic development victories with Owensboro job expansions at U.S. Bank, On Time Fab, Metalsa, Swedish Match, Specialty Food Group, and Uni-First Corporation. Smother’s Park named the best playground park in the World. California based Alorica opened a call center which initially employs 500 with plans to expand. The William Natcher Parkway was approved to be upgraded to Interstate Highway status. Supported continued growth and support of Owensboro Regional Airport. Supported expansion of new recreational facilities (Legion Park facility, Foot Golf at Ben Hawes). Founded Safe Ride program to reduce the risk from impaired drivers on our roadways. Fought to keep Hillcrest Golf Course open. Endorsed “White Flag” program to protect families during severe winter weather. Maintained support for the Owensboro Riverport as an economic engine for our region. Maintained strong funding and support for our first responders (OFD, OPD, and 911 Call Center). Served as a two-term member of the Greater Owensboro Chamber of Commerce Board. Served as city representative on the Mayor’s Committee to Improve Small Business.